Our floor boards are 27m thick single tongue and groove with expansion gaps on the underside. A thicker floor is sturdier and will hold more weight, important if you are putting furniture or other heavy items inside. There should be less bounce as you walk across it compared to thinner floors. The tongue and groove design helps the floor boards to fit together securely. The expansion gaps on the back of the floor boards are very important. All the wood in your log cabin will expand and contract in the different seasons and temperatures, this is perfectly natural. 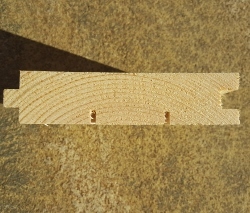 If a floor board doesn’t have expansion grooves, when it expands and it cannot move any further because it is pushing on the other floor boards and the walls, it will push upwards and make the floor uneven. The expansion gaps allow the log cabin floor boards to expand further without pushing upwards.